Kaitlynn Park, 18, and Aramis Mobley, 19, a homeless couple, were getting clothing and food at a public beach in the Pacific Palisades, which is held up as a model of success for a community helping the homeless.Photograph by Philip Cheung for The New York Times. are encountering homeless people in places they never did before. I drove around the city to see what that change looks like. the homeless and some communities have mobilized to keep shelters out of their neighborhoods. One setting for this clash is public libraries. when they stake a claim on tourist-heavy venues. On the Hollywood Walk of Fame, glitz and squalor collide. In Santa Monica, case workers and doctors visit the streets every day, offering medical aid and guidance on how to get help. 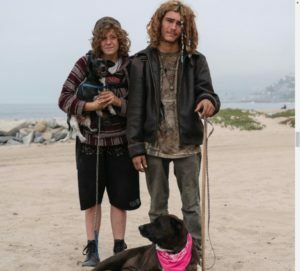 Los Angeles Mayor Eric Garcetti has called homelessness the “moral crisis of our time,” and voters have approved millions of dollars to tackle the issue. As I walked around with outreach workers, passers-by often stopped, seemingly surprised to see someone talking to the homeless.